Since Christmas 2007 I'm the proud owner of a Nikkor 60mm Micro Prime lens. This article contains a quick run-down of why this lens is made of awesome. So I'm now the owner of a tiny fixed focal length, plastic lens. What's so special about this 60mm prime ? It can be summed up in one term: Focus distance. All lenses have a minimum focus distance; where the subject can't be closer to the lens without becoming blurred in the final image. The 60mm is special in that it allows you to put the lens really close to the subject, making it possible to create life-size images of tiny objects. The lens does require special techniques. Because you are trying to capture a very small area; that area must reflect a lot of light. Hand holding the lens is usually out of the question, because the shutter speed would be too slow to get a sharp image. There's two methods for fixing this: using a sturdy tripod, or using external flash units. Preferably both. Put the camera on a big tripod, and tilt the lens down. This is why you need a sturdy tripod, a plastic one would tip over, crashing the camera into the floor. And we don't like that. Next, I have my SB800 flash unit mounted on a tabletop tripod, positioned very near the subject. Then it's time to position the subject underneath the lens. For best magnification, the lens needs to be 6 centimetres away from the subject. As depth of field is very very very shallow at this point, you need to spend some time positioning the camera. To maximise detail in the picture, the aperture needs to be set to a fairly high value. I usually use f13 or thereabouts. This is where the flash comes in: You won't have enough light at these values! Proceed taking pictures, until you get the one that looks juuuuust right. And you're done. For best results, you really need to be able to position the Flash independently of the camera. However, the SB800 allows you to point it down 7 degrees, allowing for a little flexibility when shooting flowers and stuff in area's where you can't really go all out setting up your stuff. When I posted some images that were created using this lens on photo-sharing site Flickr.com, I got the response I've come to expect. You see, most people on the site only take pictures at eye-level using standard lenses. So anything out of the ordinary becomes an Amazing Feat of Photography. 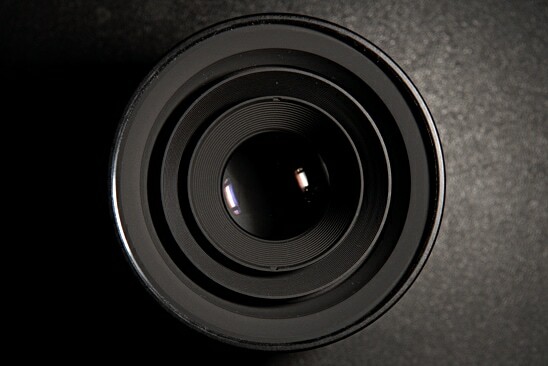 Just like extreme wide angle images, extreme close-up images can't be created by normal lenses. They require specific techniques, and an investment in photography beyond your bog standard digital rebel. Basically, anything shot with this lens looks like magic to the average Flickr user.